These whips belonged to an artist of the Russian National Circus. They were used in a horse show, and also for targeting and tricks. The braid is unusual, as it is not the 4-seam herringbone pattern but a "checkerboard" braid like on handles, while the handles themselves are just spiralled. The material is rawhide. 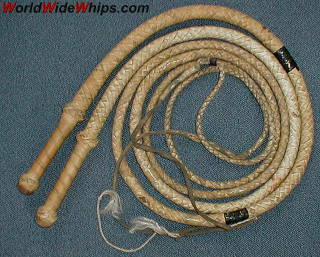 The whips suffered several damages which were repaired by simply putting some tape around.